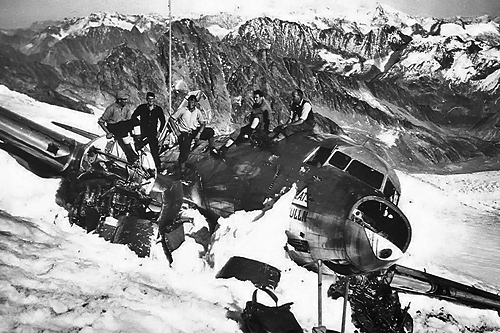 In this Dakota Hunter Blog, you’ ll see a series of awesome photos of a C-53 Skytrooper that flew into a Swiss glacier some 70 years ago. 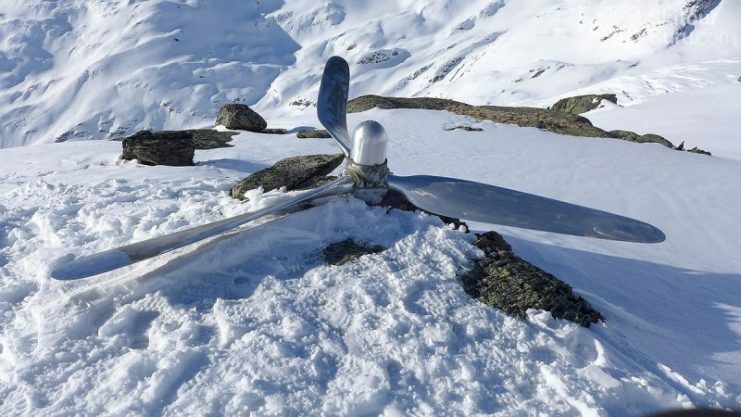 All 8 passengers and 4 crew members on board were extremely lucky to survive the crash that ended in a harrowing glide over the snow-covered ice mass, named the Gauli Glacier in central Switzerland. In that accident, the rugged C-53 remained remarkably intact, the reason that only a couple of occupants got lightly injured while all others stepped out unscathed. 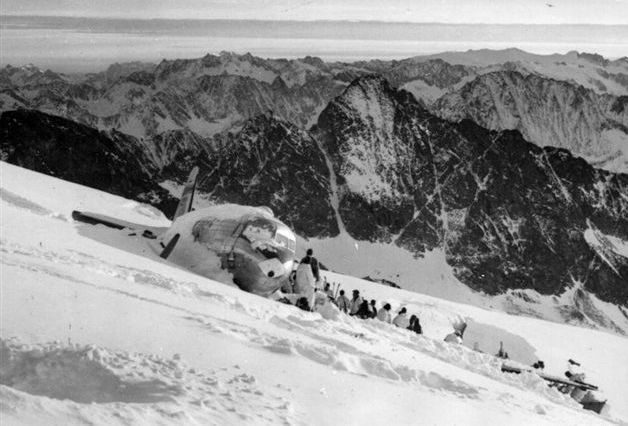 But their nightmare experience was not yet fully over, the position of the aircraft was not exactly known and hard to find in the adverse mountain weather, so it took the rescuers 6 days and nights before they reached the spot and were able to airlift the occupants to the comfort of a hospital/hotel bed. On November 18th, 1946 the C-53 Skytrooper with serial 42-68846 took off from Tulln Air Base near Vienna, Austria, bound for Pisa in Northern Italy. The pilots opted for a longer 2-days detour flight to the West over Southern Germany and France in order to circumvent the prevailing bad weather over the central High Alps. 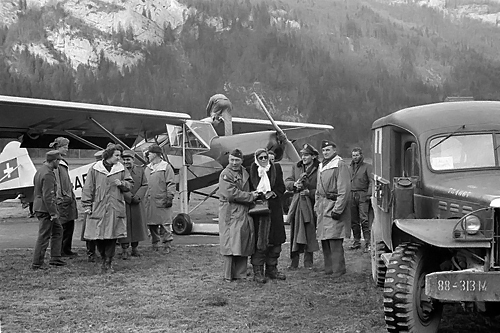 Soon after they flew over Innsbruck in the Western Austrian Alps, the crew encountered adverse weather conditions. While flying over Switzerland (Canton of Bern), they had lost their orientation and their actual flight path ended deeper South into the Alps of Central Switzerland. At a speed of 170 mph (280 km/h), the aircraft encountered a violent downdraft (katabatic wind), comparable to a microburst that can ‘push’ even big jets into the ground on approach flights. The downdraft made the aircraft lose height rapidly in poor visibility. At 2.45 PM, it hit terrain and crash-landed into the Gauli Glacier at an altitude of 3,350 meters, located about 8 miles south of the Swiss Air Force Base Meiringen. The immense luck of hitting a snow-covered near-flat terrain with a slightly sloping hill in an aircraft, stepping out alive and telling your family, was a God Gift. Only a few people experienced similar situations of flying into terrain and tell the story afterwards! The crew was able to send a distress call from the stricken plane that was picked up in Paris and Lyon. They presumed that it had crashed in the French Alps. Two days later, an officer based in the control tower of the Meiringen airbase, received a message on his frequency as well and gave the alert of a new radio bearing, narrowing the search area to the Gauli Glacier. During a break in the overcast, an aerial spotting of the C-53 was executed by the crew of an RAF Lancaster in the morning of Nov. 22nd and coincidently, an overhead flying USAAF B-29 on its way to Munich was also able to locate the wreckage one day later. 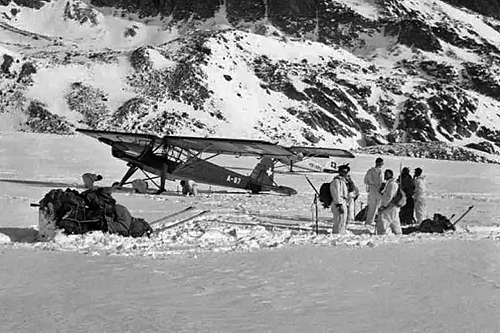 After several low fly-overs made by Swiss aircraft, an Alpine ski-equipped Rescue patrol of Swiss soldiers went up to the glacier and was the first to make physical contact with the stricken aircraft and the 12 occupants who had survived the long days and nights in their deep freezer container aka the C-53 cabin. It took the rescuers 13 hours to get up there and it was too late to descend that same day. The next day, they took all occupants downhill to the Gauli Alpine Hut at 2,200 m. altitude. 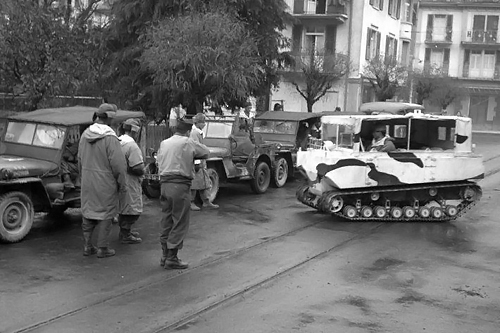 Once the location of the accident was known, the US Military started their own Rescue Operation with a rapid deployment of tons of special transports. By train, there arrived the Jeeps, Ambulances, and a number of Snowcats. The photo depicts US Army personnel with the Jeeps and the Weasels (made by Studebaker for Arctic Rescue operations). Unfortunately, the Weasels were of no avail in the typical Swiss environment with deep glacier snow and steep mountain terrain. Those conditions were better handled with the Swiss expertise of mountain rescue operations and their special transports. The Swiss deployed two ‘Special Operations’ Aircraft for the Rescue Operation. The photo depicts the two Fieseler Fi-156 Storch (Stork) aircraft of German origin that airlifted the passengers and crew of the crashed C-53. Of that Reconnaissance/Liaison Light Aircraft, more than 2,900 were built before, during, and after WW II by Fieseler (who also built de V-1 Buzz-Bomb) and Morane. Equipped with both skies and wheels, the light aircraft could land on (patches of) snow and in (rough) terrain. The genius of the Fieseler design was in its wing design and its ‘long legs’. The wheel suspension struts are not attached at the lower fuselage frame (as was/is normal practice) but are extended up to the overhead mounted wings. That insect-like appearance allows for an extremely long vertical ‘travel’ of the wheels during landings, making the aircraft a serious contender for the title “Master of the Moguls”. The aircraft (also built in France, Russia, Rumania until the 1950’s) had an excellent STOL performance due to a lightweight construction and an advanced wing design. A fixed slat ran along the entire length of the leading edge of the long wings, while a hinged and slotted set of control surfaces ran along the entire length of the trailing edge. The aircraft was used in 1943 in a most spectacular escape of the fascist leader Mussolini. 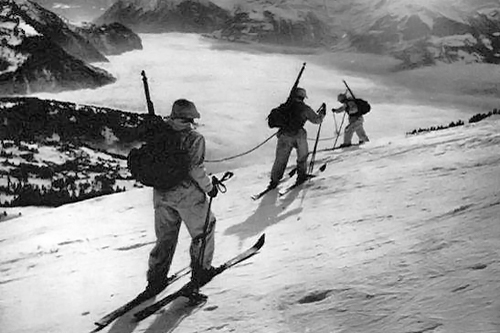 He was imprisoned at Campo Imperatore Hotel (a ski resort in Italy’s Gran Sasso massif, high in the Apennine Mountains) by the Italian Government when it became clear that Italy was about to lose the war. The Germans launched their air raid with 10 gliders with 90 soldiers and a Fieseler. They landed out of the blue next to his prison hotel, released the ex-dictator and flew him from that mountain out to his German friends in Vienna. Mussolini must have peed his pants as that little aircraft he was shoehorned into, had an extremely narrow cabin and was most likely overloaded with its 2 passengers and one pilot. 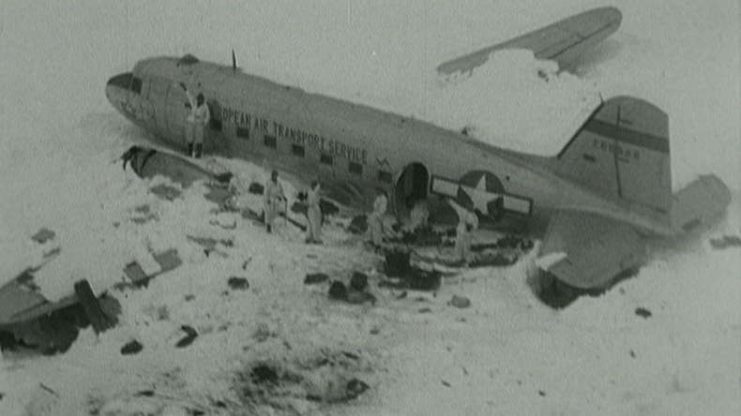 The 6-days stay in their Glacier prison came to a good end for all 8 passengers and 4-man crew of the stricken C-53. Two versatile German aircraft Fieseler Storch planes airlifted all of them from the Gauli Glacier to the Swiss Meiringen Air Force base, only 8 miles away, where this photo was made. High ranking US Military and two women were under the passengers, seen here, a bit shaken but relieved with the Happy Ending of their Nightmare. The Dodge Ambulance standing at right took the wounded to the hospital. In the summer of 1947, the dismantling of the aircraft started. The most precious parts like engines, and (cockpit) interior were airlifted from the scene. 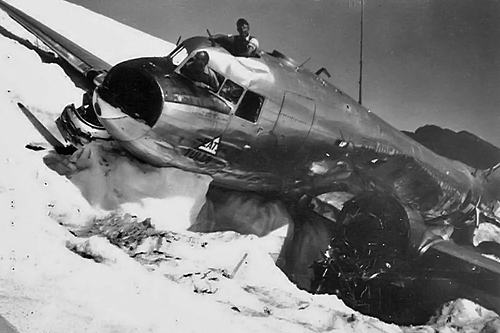 The bend propellers were left behind and the partially empty but intact airframe was left behind on the Glacier, becoming a toy for the Glacier’s grinder capacities. The shiny airframe of the C-53 is seen here intact for the last time in 1947. The elements and the crunching power of the glacier have torn the airframe and wings apart over the years that followed, resulting in the pulverizing of the larger parts to smaller pieces that were deep-frozen inside the glacier. 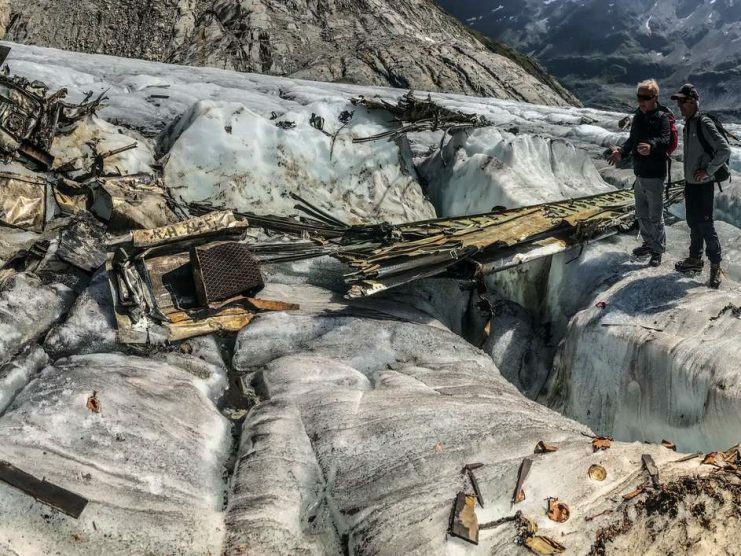 But with the accelerated melting of glaciers worldwide, also the Gauli has been affected by the warmer temperatures of the European summers and in 2012, the shrinking glacier released its first souvenirs from that 1946 aircraft crash. 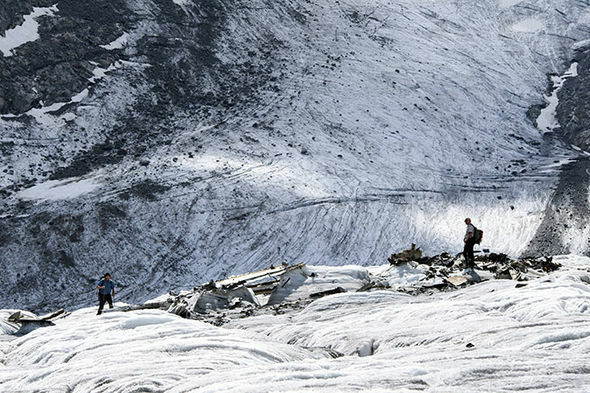 Amazingly, in 2008, I visited in the Yukon, Canada, another wreck of a USAF C-47 that crashed in very similar bad weather conditions on a search mission. 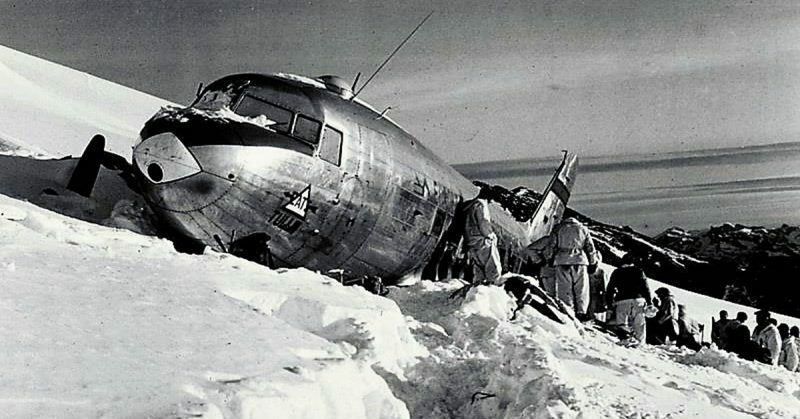 That accident happened in 1950, the C-47 was also caught in a downdraft and hit terrain, a snow-covered hill while no obstructions were met on the gliding path of the aircraft. With the airframe still intact, all occupants stepped out alive and also had to wait for their rescue for days. But the big difference makes the glacier: where the Gauli wreck was eaten by a huge metal-grinder, the Yukon wreck is still there as if the crash happened only a year ago. Never saw such an impressive crash site in my life with such well-conserved airframe still there, largely intact with only engines and nose cone removed. If you like this story, may I recommend you to check out my two books, both illustrated with hundreds of unique photos and harrowing adventure stories. My first book is about the DC-3/ Dakota/ C-47, titled “The Dakota Hunter”. Read the very positive reviews on the Amazon order-page ( scroll down to reviews) and you can order the book right away if you like (see cover below). See Amazon order page The Dakota Hunter. My second book has just been released and is with 400 photos on 290 pages the most complete photo album of the PBY Catalina that you can buy. It has as title “80 Years, a tribute to the PBY Catalina”. (See cover below). 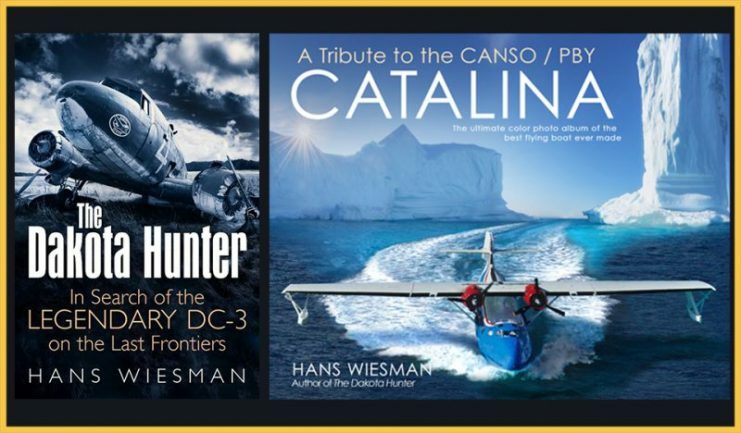 You can order the book now at Amazon Order page / 80 Years, PBY Catalina.